Sandstone Gardens started in a one-car garage in 1986 with the intentions of being a “supplemental” side income for newlyweds Max & Vicki Carr. 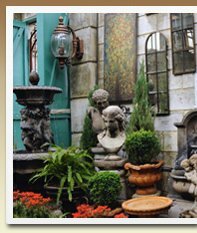 Working countless hours before and after their 8-5 jobs, the Carr’s made molds and cast small traditional cement garden statuary. In the first year of their “financial experiment” they sold their wares from their home on weekends, and then juried craft shows in Tulsa, Oklahoma City, Wichita and various other places. After a year the Carr’s quit their jobs and set sail as a full time business, pursuing larger venues which eventually took them to Chicago, Richmond, Virginia, Boston, Philadelphia, and Newport, Rhode Island (New England). The perpetual “opening door” to all these venues, and what is still the distinguishing element in all they do, are the exceptional vignettes and displays envisioned and implemented by Vicki Carr to augment their enduring product. From the early to recent shows, if awards were given for displays and presentation, Sandstone is often the recipient. 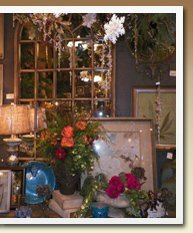 In the many years they have participated in the Prestigious Philadelphia Flower Show, Sandstone has taken the Blue Ribbon numerous times, while always finishing in the top 3 from over 125 vendors. 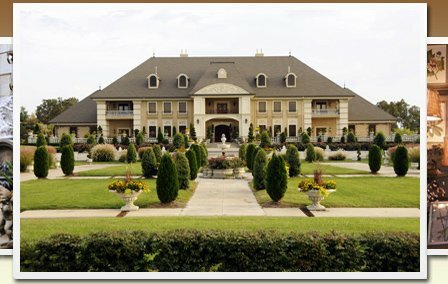 In the early 90’s, the Carr’s established a retail location on South Range Line Road in Joplin, Missouri, nurturing an empty property to a facility which included a main showroom, with display greenhouses and gardens, featuring our vast array of outdoor garden statuary, having its grand opening in November of 1994. With Sandstone’s continued growth and expansion of offerings, the Carr’s purchased 68 acres on I-44 in 2002. Spawned by their passion for esthetics and architecture, combined with their visits to Estates on the east coast, the Carr’s conceived and built Sandstone Gardens as it is known today; the perpetual work in progress, opening its doors in May of 2004. Despite the opulence of the shopping experience at Sandstone, The Carr’s strive in their buying to bring together a collection of timeless lines and styles that are affordably priced. Always gleaning and implementing from new trends, Vicki’s philosophy is “Classic style neither goes out, or comes in. It’s timeless, if it’s tasteful”.